Radiant Historia is a RPG experience for your Nintendo DS with time travel elements making up the core of the experience. The game was developed by Atlus who worked on many other popular games in the genre including the highly received Nocturne and Persona 3. 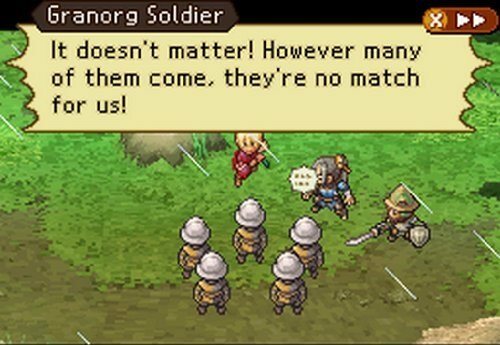 Radiant Historia is set on Vanqueur, which was the site for a once powerful empire that destroyed itself by using a powerful energy within the game world known as Flux. The current game world which players will have a chance to explore features all manner of species creating a multiple race and highly fantasy based adventure. Not only is the story well-presented but it’s also a very unique offering which involves the use of time travel. This power is given to the player by two mysterious children early on in the game from here the player must choose from two options that create their own storyline. This choice isn’t as clear cut as it seems though as these two plot lines are intervened together with the player freely jumping between them with the power of time travel which allows them to switch into these parallel universes as they please. It’s this system that allows players to gain skills and information that aren’t available within a single storyline. This time travel mechanic also means that there are a multitude of endings available to the player based on their efforts in the game. Outside of time travel players will spend most of their time in the combat which is a standard turn based affair. 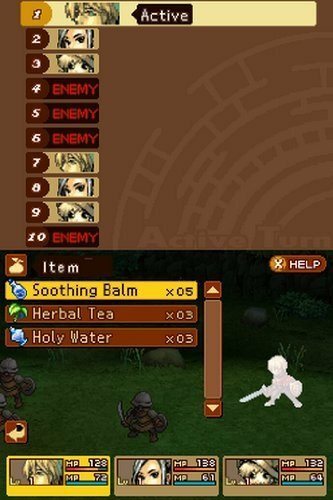 Combat in Radiant Historia is started when players hit an enemy and are then taken to a separate grid based screen (3×3) where battles commence in a turn based fashion that most gamers will be familiar with. Radiant Historia is mostly a standard offering in the Japense role playing genre but it does everything with a nice touch of polish. It’s the time travel elements that really set it apart though. Unique time travel elements create an interesting adventure and story. Japanese role playing experience for Nintendo 3DS. A great fantasy setting and game world to explore. Crisp turn based combat that doesn’t innovate but is delivered with polish.